Twitter reveals user data in court case: " "
YouTube - Micro-Blog Reveals Premeditated Explosion: " "
China's Press Freedom Continues to Deteriorate: " "
Kebede: "I cannot live without the profession I have now"
Every week CNN International's African Voices highlights Africa's most engaging personalities, exploring the lives and passions of people who rarely open themselves up to the camera. (CNN) -- Sharing a communal cell with 350 other prisoners, Ethiopian journalist Dawit Kebede spent 21 months in a crammed jail, losing his freedom for speaking his mind. That was his penalty for writing an editorial criticizing the Ethiopian government after the post-election violence that rocked the country in 2005. But while many of his colleagues left the country after they gained their freedom, Kebede decided to stay. 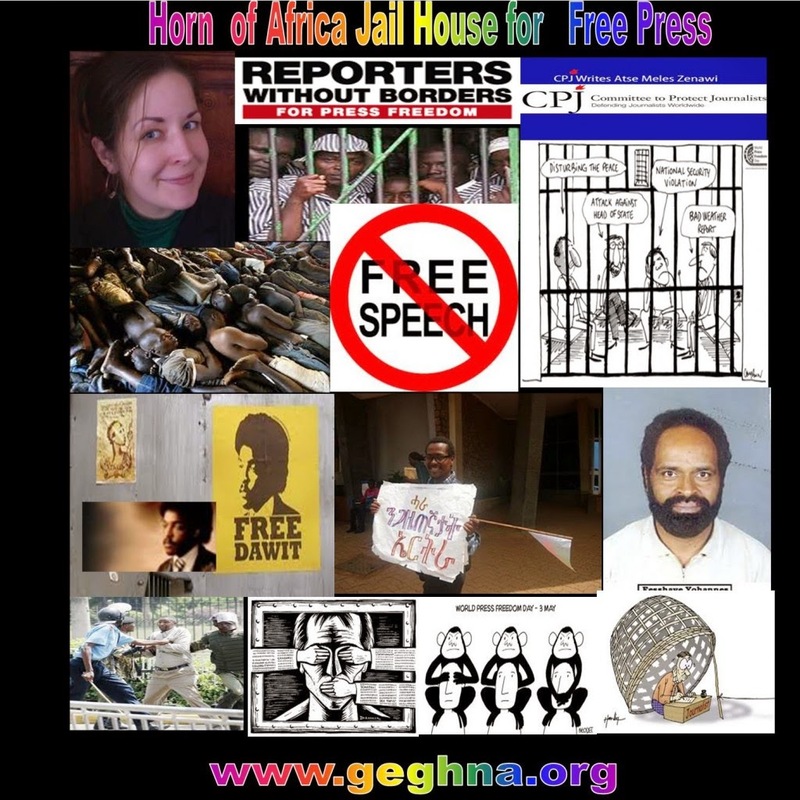 He became the editor of one of Ethiopia's only independent newspapers, with his commitment to his trade earning him an International Press Freedom award from the Committee to Protect Journalists (CPJ). "It's my belief that getting outside or preferring exile and living under such repressive situations are the same form, because as far as I go in exercising my professional duty abroad, that doesn't replace the ultimate freedom that I need in my entire life," says Kebede. As a result, rioting broke out and hundreds of people were killed as the police and the military opened fire on protesters. Determined to report what happened in the aftermath of the election, Kebede wrote a piece criticizing the government of Prime Minister Meles Zenawi. "Supporters of the main opposition's party protested, because of the election results, so the government massacred nearly 200 protesters," says Kebede. "I asked why people lost their lives while peacefully protesting an election," he adds. "Unfortunately, the government arrested me (and) the senior leaders of the main oppositional party, and I was charged with dozens of charges -- genocide, attempt to subvert the constitutional system, high treason and nearly seven counts." Kebede, along with other journalists, was sentenced to life in prison by an Ethiopian court but after almost two years he was released by presidential pardon. While other jailed journalists decided to leave the country following their release, for Kebede that was never an option. "Most of my former cell mates are in exile now, but for me freedom doesn't mean that," he says. "Exile is not an ultimate solution for freedom." I will never hesitate from criticizing for the betterment of this nation, whatever regime can have the power. For the fearless journalist, there was no other choice but to stay in Ethiopia and do what he calls his professional duty. Just two days after his release from prison, Kebede asked the Ministry of Information to grant him a publishing license to run his newspaper again, only to find out that he was blacklisted. He was eventually given permission, and in February 2008 Kebede launched Awramba Times, a weekly Amharic-language newspaper, which is one of Ethiopia's last remaining independent publications. In November 2010, Kebede traveled to New York to receive an International Press Freedom award from the Committee to Protect Journalists (CPJ), an independent organization promoting press freedom worldwide. "When the CPJ asked me to explain three things people should know about me, the first thing is I cannot live without the profession I have now," Kebede says. "The second thing is, unless it becomes a matter of a question of life and death, I will never leave Ethiopia. "The third thing is, I'm not in opposition. If I believe anything for the betterment of this nation I will never hesitate from criticizing for the betterment of this nation, whatever regime can have the power." However, that stance doesn't come without risk under a regime that has been rated as one of the world's worst when it comes to press freedom. Kebede says the Ethiopian press exists in a climate of fear, claiming that after the 2005 election it hasn't been easy for journalists in Ethiopia to do their work independently. "For the last three years we are just facing this political climate, not only our newspaper but many journalists in this country are forced to self-censorship if they prefer to work in this profession," Kebede says. But he is determined to work for his country's hard-won freedoms. "Newly won freedom cannot be taken away," Kebede says. "If you was given freedom, freedom by itself is a God given right actually, but such God given freedom cannot be denied." YouTube - Half of workers 'banned from Facebook': " "